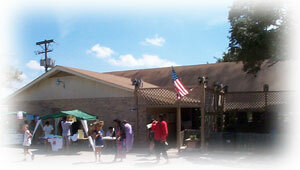 The Asian American Cultural Center is nicely located on Jollyville Road, north of the Arboretum. It is only 2 minutes' drive from the intersection of US Hwy 183 and Duval Road. The Center has a total area of 2.73 acres (approximately 110,000 sq. ft.). There is about 12,000 sq. ft. of building floor area. Inside the buildings, there is a Hall, capable of seating 200 guests, plus more than 10 rooms of different sizes. They will be used to accommodate indoor activities such as holding seminars/workshops, meetings and classes, serving both cultural and educational purposes. The Hall can also be made available for members to hold receptions and banquets. Outdoor activities and classes will be held in the 1500 sq. ft. pavilion, or on the lawn under the shade of the trees. Being the owner of this piece of property, the Asian American Cultural Center is determined to make full utilization of its resources to achieve its Mission. A Feasibility Study on future development will be carried out by year-end.